Several people asked about the recipe for the dish I made last night for my 10 Tips for Cold Weather Grilling post. It was actually "homework". I have been taking a few lessons at Rouxbe Online Cooking School. After watching the lesson comprised of several short videos (the one below was one of 8 for the lesson) you have practice assignments to apply what you just learned. This dish was what I came up with for my assignment. Season the chicken with the poultry rub and let sit at room temperature. Fire up your grill and let it preheat. Start making your veloute sauce. In case you can't get video, it's basically making a blond roux with the butter and flour. Gradually whisk in the stock in small increments, kind of like a risotto. Use the best stock you can get because it is the star of this sauce. I had made two quarts on Sunday so I used a little over two cups of that. It's not an exact measurement because you go by the texture of the sauce to know when you've added enough. After it has simmered lightly for 20 minutes, I add in the chiles and parsley. I break one end of the chiles and pour out the seeds so I'm using mostly only red pepper flake. 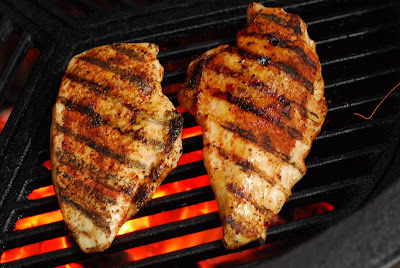 Grill the chicken over direct heat at 400f for 5 minutes. Flip and cook another 4-5 minutes, or until the breasts hit 160f on an instant read thermometer. Remove and let rest. Add the 1 Tbsp of very cold butter to the veloute sauce and stir until slowly melted and emulsified into the sauce. 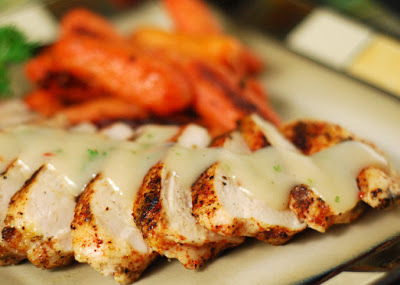 Slice the chicken in 1/4" slices, fan it out, and spoon some of the sauce across the chicken. 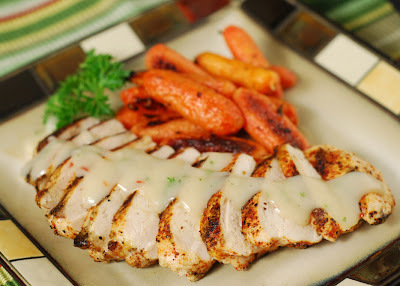 I served ours with Reeni's Roasted Lemon Garlic Ginger Carrots. It all disappeared quickly.